Every show rabbit must had an identifying tattoo in its ear. As a kid raising rabbits, we never worried about tattoos in their ears – we knew which rabbits we had and which cages they called home. No biggie! As an adult coming back into raising rabbits the need for tattoos has become apparent. Not only are tattoos required for any rabbit in a show, having permanent ear markings can come in quite handy when you’re trying to discern just which all black bunny you’re you’re checking out! Almost every rabbit we have has an ear tattoo now. ARBA requires the tattoo to be in the rabbit’s left ear. If you choose to register the rabbit, they receive another tattoo in their right ear. 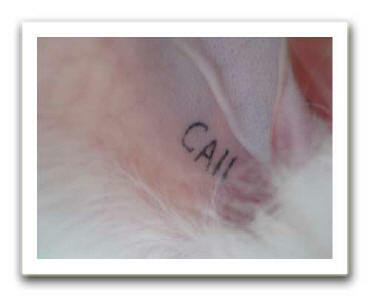 Tattoos can be words, letters, numbers, or combinations and can be applied using a clamp or a tattoo pen. We have chosen to use the KBtatts Tattoo Pen. This is the only tattoo device we’ve used so I don’t have a basis of comparison, but I don’t want to use another one… ever! I was expecting the rabbits to twitch or jump while tattooing… and they don’t. In fact, I began to wonder if I was actually tattooing correctly because they didn’t move a bit. Turns out it’s just a great pen with a quiet motor and needles that get the job done quickly and efficiently. Trying to decide how to tattoo is another fun occupation. We’ve decided to use a system that begins with “H,” representing Mad Hatter Rabbitry, the number of the month the rabbit is born in (using letters for any two digit numbers), the last digit of the year, the number of the rabbit in the litter, first letter of the name of the sire and first letter of the name of the dam. So, Mister, who was born in November 2012 and is the first kit out of Bucky and Duchess, has the tattoo: HB21BD. Other people will use their own system or the name of the rabbit. Judges at shows get an eyeful when they see rabbits with names like “HOT STUFF,” “DINNER 4 5,” or “HONEY BEW BEW.” Hopefully judges keep a good sense of humor and breeders use common sense in their tattooing! I absolutly love the KBTATS pen Awesome!! Me, too! I hope I never use another!